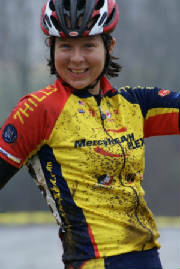 See who's instructing at the 2009 Midwest Women's Mountain Bike Clinic! Where are you from? Born and raised in San Diego, CA, but lived in Austin, TX for many years and learned to ride there. Now taking up residence in Columbus, IN. Favorite trail? Just one? How about one West and one East... My heart belongs to City Park in Austin. My favorite East Coast trail is the Plantation Trail in WV. 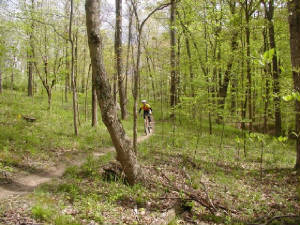 My favorite place to ride in the Midwest is Brown County State Park. Favorite bike? Independent Fabrication Deluxe steel hard-tail. Riding Highlights I used to race... a long time ago, but I find that I enjoy teaching and introducing people to the sport more. A friend and I started "Ride Like a Girl" in Austin over a decade ago and it's still going strong.... I'm pretty proud of that. I've taught at multiple clinics and camps (this is my third year at the Midwest Women's Clinic), volunteered for Trips for Kids and worked as Mountain Bike Patrol. I also enjoy building and maintaining trail. Be Warned: I like to rescue turtles and (when I find them) fawns from the trail. I hate to see anything smushed. I should have a sign on the back of my bike that says "Warning: Stops for Small Animals". Where are you from? Born in Hong Kong and moved to Canada when I was barely a year old. I grew up in both countries, alternating back and forth every few years. I am now currently residing in Chicago, IL. How long have you been riding? 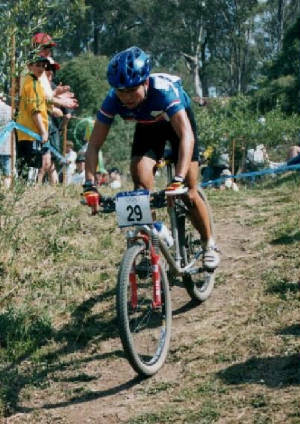 I competed in road races, track events and mountain bike events between 1997 and 2003. I started my professional cycling career at age 25 and advanced rapidly in the sport, eventually representing cycling teams in Italy and in the United States. 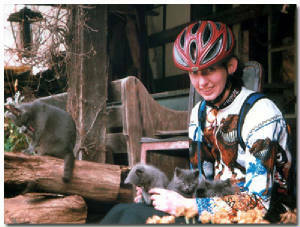 Riding Highlights After completing my undergrad studies at the University of British Columbia, I moved back to Hong Kong and shortly thereafter was recruited to the Hong Kong Cycling Team and began to compete in regional Asian races. Encouraged by my coach, and with a strong team of supporters behind me, I spent 1999 chasing Olympic qualifying points in international bike races all around the world. After a lot of hard work, travelling for 48 weeks to 15 different countries in 5 continents, the goal of qualifying for the 2000 Sydney Olympics was achieved! I had become the first female cyclist to represent Hong Kong at the Olympic Games. Where are you from? Originally from Brooklyn, NY. Now living in Florida. What is your favorite trail? Volunteer Trail at Oleta River State Park in Miami, FL. Riding Highlights I was the first girl to compete in a Freeride/Dirt Jump competition in the state of Florida (Santos 2006). I didn't win, but it still rocked! I used to run a bike shop that specialized in Freeride/Dirt Jump/Urban/Downhill bikes and recumbants in Florida (a very rare beast) and was very successful. We had a two page spread in "Decline" magazine with a custom Urban bike that we put together. If you could ride any trail in the world, where would it be? Downhilling in the Swiss Alps with my parents and husband. Riding highlights: My family and I used to be white water kayakers until we discovered mountain biking. Then my dad bought me my first mountain bike for my birthday and I quickly fell in love with everything mountain biking. After years of living the "weekend warrior" mountain biking lifestyle, I realized that I wanted to be more involved in the mountain bike industry and help grow the sport. 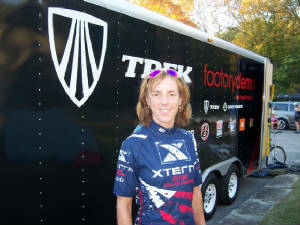 I left my executive HR position in corporate america and took a mountain bike coaching position with Mad March Racing (www.madmarchracing.com) and am truly enjoying helping riders progress safely and have more fun on their bikes! Where are you from? I've lived in Indy all my life. Favorite trail? Any trail when I am riding with friends. If I had to pick one trail though, it would be Porcupine Rim in Moab. Definitely the most technically challenging trail I have ever ridden. And the most scenic! Back home in Indiana, my favorite is Brown County, of course. Favorite bike? My current bike! I splurged on titanium and it is a dream to ride. It's a better bike than I am a rider, but it makes my riding experience so much more pleasurable. It's got pink Chris King hubs and headset... sweet! If you could ride any trail in the world, where would it be? I love riding in the Southwest states, but anywhere in the world??? Maybe Sweden or New Zealand. Riding Highlights Competing in the Chequamegon Fat Tire 40 - a mass start, cross country (40 mile) mountain bike race on the Birkebiner cross-country ski trail in Northern Wisconsin. It was fast and crazy and I loved it... so much that I'm doing it again this year! Where are you from? I'm originally from the Upper Peninsula where deer, wolves, bear and moose outnumber humans about 1000 to 1, but I now reside in Cincinnati, OH. How long have you been riding? I've been riding bikes since '05 and then bough my first mountain bike in '06. To round out the family, I bought a cyclocross bike in '07. 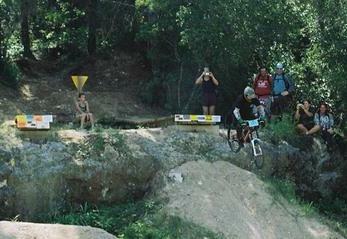 I race road, cyclocross and mountain bikes. Favorite trail? My favorite trail is the Right Loop in Tsali, North Carolina. Favorite bike? JiJi - my '07 Fuji Cross Pro (cyclocross) bike is my favorite next to JiJi's sister (no official name yet) my '08 Gary Fisher Hi Fi Pro 29er. If you could ride any trail in the world, where would it be? I am engaged and our honeymoon will either be mountain biking in Tahoe, CA or road bike riding in France/Italy. Need to see how the stock market does first! Riding Highlights I was on a group road ride in '06 when I crashed into a guardrail on a steep descent and smashed my face. One of my male riding partners called my "then" boyfriend to tell him he was taking me to the hospital for stitches. My "then" boyfriend did not come to the hospital, but stayed with the guys from work at the bar and watched football instead. Needless to say, he's now the ex and the guy that took me to the hospital is no my fiance! 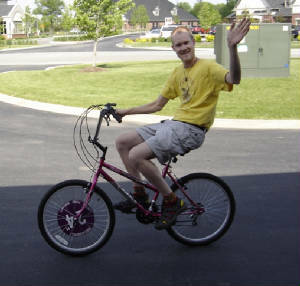 Oh and the fiance (whose family owns a bike shop) was already on his way to stealing my heart when I took my bike in to be fixed a couple days before the accident and it rolled out of the shop with STREAMERS on the handlebars. Now all my bikes have streamers! Where are you from? Peoria, IL - never lived more than 70 miles from here, but travelled afar. Favorite Bike? My current one, a Fisher-Sugar. It made me a much better rider. If you could ride any trail in the world, where would it be? hmmm, NW Coast, Colorado, anywhere I haven't been. Riding Highlights: My newlywed husband and avid cyclist took his totally newbie-mtnbike rider bride to Moab for the Mountain Bike Festival. My first day I fell over at least 50 times, refusing to go fast enough and every rock stopped me and I toppled sideways. I was bruised up and down my shins from hitting the toptube. My second day I added speed and slammed into a sandstone wall cracking 3 ribs and adding a mild concussion when I locked the brakes going down a gravel track.... 17 years later I'm still riding and loving it! My current bio (Xterra World Chamption F50-54 and 70.3 qualifier) shows that I've been lucky enough to find a sport that combines my running background and my love of cycling. The swimming came along as a new challenge. If you could ride any trail in the world, where would it be? Any trail far away from Indiana... been awhile since I've had a vacation, I could use some time away. Riding Highlights: Either the first race I won with other people entered, or the small victories when I finally ride something I'd been scared of or had lots of problems with. Favorite Trail? This is tough, I have like 20 favorites! 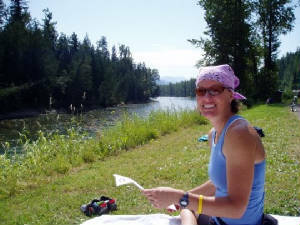 Locally it is the Pacific Northwest Trail from the Oyster Dome to Bellington Bay... soooo FUN! Favorite Bike? This is tough too! I'd have to say my Kona Minxy. It is Kona's women specific freeride bike and if I could only have one mountain bike, it would be this one! If you could ride any trail in the world, where would it be? The World Cup DH track at Mount St. Anne in Quebec. Riding Highlights: This past 'cross season I raced my first US Gran Prix (in Portland) and lined up on the starting line with over 60 women! That was the largest field I have ever raced against and it was a mass start. I was so excited and overwhelmed I wanted to shout "YOU GO LADIES!" as we wll clobbered up the first muddy run-up together. We were packed in so tightly and there were so many of us I had to run with one arm covering my head so I didn't get knocked out by flying bikes and bodies. It was AWESOME! Where are you from? Originally I am from New Hampshire, but I have lived in St. Louis, MO for the past 20 years. How long have you been riding? 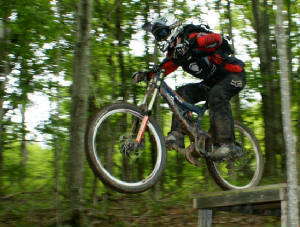 I have been a bike junkie all my life, but didn't start mountain biking until 4 or 5 years ago. Over the past few years I have gotten more serious about riding, century road rides, cyclocross racing and mountain bike racing. Favorite Trail? 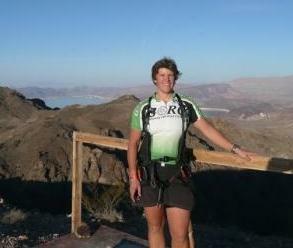 I usually find any challenging trail with rocks and great descents to be my favorites. Riding Highlights: A few years ago myself and two other women took a trip out to Fruita, CO and did a 4 day hut to hut mountain bike trip. It was awesome! Since I never officially mountain biked when I grew up in New Hampshite, every time I go home I ride up and over this little mountain called Gap Mtn. I've never seen anyone ride it before; there is a short section of hike-a-bike, but then the descent is amazing! Where are you from? I was reared in Hazard, KY and have since done time in Louisville and various town in south central Indiana. How long have you been riding? I've been riding mountain bikes about 19 years, starting on reclaimed surface mines and finally finding the joys of singletrack (without dirtbikes or hillbillies with guns) in '94. Riding downhill since then, so to speak. Favorite Trail? 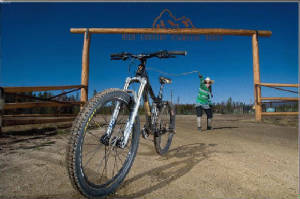 My favorite trail would have to be the Casino Loop in Stanley, Idaho. A six hour ride with a nine mile climb and a ten mile descent. Favorite Bike? "The" bike is a six inch plush travel all mountain that is just over 30 pounds and setup like a sofa... nice and cushy. I ride a Scott Ransom at this point. If you could ride any trail in the world, where would it be? If I could ride any trail in the world, it would be the Brown County and surrounding trails as they will be ten or twenty years from now. A buff Schooner and many more trails we haven't thought of yet. A weeks worth of connected backcountry riding and camping all in Indiana. But, I'm willing to wait for that. Riding Highlights: I was a slacker and didn't respond to this question, so Tania is just going to say that every ride with her is a highlight. CHECK BACK SOON FOR MORE INSTRUCTOR BIOS!